I was too sick to write up a wine recipe today, but Lilo wanted me to make a Fermentation Friday post anyway. 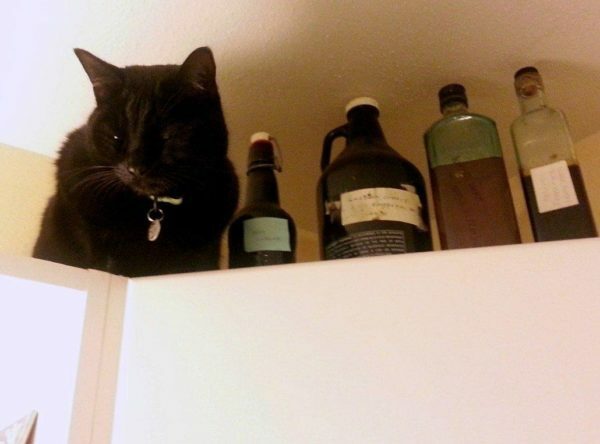 She jumped on top of the kitchen cabinets and started posing with the backstock of homemade vinegars & brews I keep up there. So today is a photo post. Next week I should be feeling well enough to share a new recipe: shall it be wine or vinegar? Leave your preference in the comments! Left to right: Lilo, malt vinegar, mixed berry vinegar, white whine vinegar, and blackberry-elderberry schnapps.